An ambitious new contemporary art space has opened outside the Tunisian capital, Tunis, including a 1,500 sq. m white cube gallery, library and residency spaces for artists. Called B7L9, it is described as a venue and "incubator" for international and Tunisian artists, but also as an outreach effort to counter “radicalism and extremism”. B7L9 takes its name from the phonetic rendering of Bhar Lazreg, an area of former farmland where some 90% of buildings were constructed without permits after the 2011 revolution. 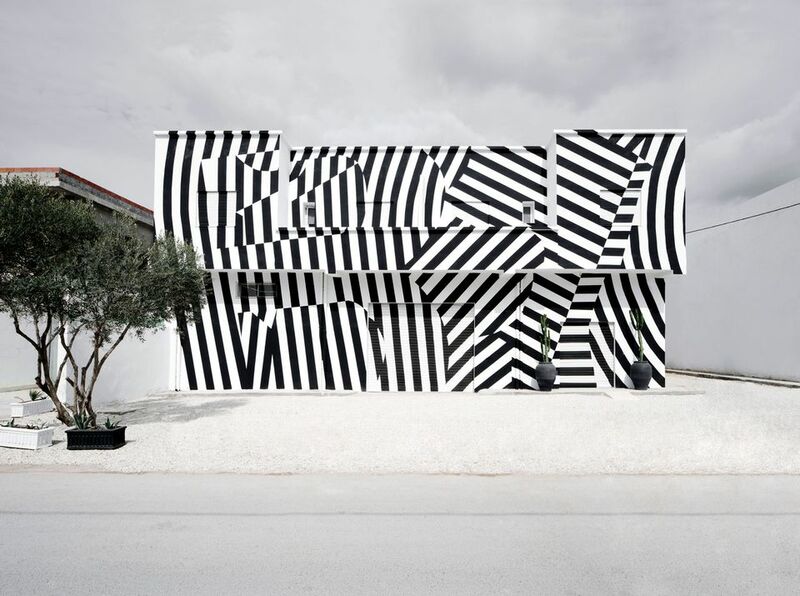 The building’s black-and-white striped exterior was painted with the help of local residents. Hatem Ben Salem, Tunisia’s education minister, attended the venue’s opening day. He said: “This experience is very encouraging. In this area, we have only one primary school, and it’s in the whole country the most crowded school. Coming to this place, this very poor place, and give people, the chance to see things they could never see elsewhere, that’s the greatest legacy.” After the 2011 revolution, people came and took land and 90% of the buildings were illegal, he said. The result was a very poor place alongside some of the richest coastal enclaves in the country. B7L9 is an initiative of the Kamel Lazaar Foundation, which produced Tunisia’s popular Venice Biennale project in 2017 and has run the annual Jaou arts festival since 2015, while supporting other arts and heritage projects. The foundation also describes the project as a testing ground for a new and larger art complex further outside the city. The show includes works from the Lazaar family collection as well as new commissions. South Africa’s Bronwyn Lace is showing the remarkable installation Mirror, Mirror, with an ostrich bone coated in gold leaf atop a human female pelvis, against a chilling time-lapse video of flesh-eating hide beetles cleaning a barn owl’s bones, and a mournful sound track of African song. The young Iranian artist Negar Tahsili staged a performance at the opening selling her own drawings of intertwined birds, fish, plants and every day objects, partly painted with a pot of her own blood. Discovered by the foundation’s vice president Lina Lazaar, she is B7L9’s first artist-in-residence. Italy’s Egle Oddo will seed the building’s garden with “extremophile” plants that withstand extreme climates, while the young Tunisian artist Younes Ben Slimane has produced chilling abstract floor plans of homes receiving mourners, including for his own father. The foundation's founder Kamel Lazaar says: “We have never believed that art should be the past time of just the privileged, and instead, believe in its power to inspire, effect change, and engage with, a whole cross section of society. B7L9 is situated in an area that is often overlooked, and this deliberate decision has been taken to ensure that we bring together people that rarely engage with one another, but to present them with a platform where they can find common ground. These interactions will hopefully plant the seeds to counter many of the challenges Tunisia faces today. At the very least, they will make for interesting and inspired conversations.” he says. Tunisia recently completed the high-rise Cité de la Culture arts centre, which technically contains a Modern art museum, but the ostentatious architecture and centralised approach of the state-funded project is unpopular with many artists. While the Tunis area has several strong private art galleries, there is no functioning contemporary art museum. The launch included a strong series of panel discussions by artists and curators, and the building is sure to offer a base for the Jaou festival. “We absolutely need a space for meaningful discussion to take place,” says Lina Lazaar. There was no visual art library in the country to read works on major international artists, she says.